If Fedge’s goal is to try all steak houses in Cebu (and beyond), mine would be to eat at least once in every Korean restaurant here in Cebu. I am continuously in search of the best bibimbap. I’ve been to less than 10 Korean restaurants so far, and the best bibimbap I’ve had is the one served at Yu Hee Jeong. Not all Korean restaurants serve bibimbap though, certainly not the one in JY Lahug. Dakimong serves mostly chicken dishes, but they also have pork, beef, and seafood. I didn’t find a good bibimbap here, but I found a unique appetizer and a new favorite – the Osam Bulgogi. Read on to find out what exactly it is. If you find a Korean restaurant that doesn’t serve appetizers for free (and not refillable), that is already a red card, aw red flag diay hehe (na-carried away ko sa Boys Over Flowers da!). Murag barat jud na nga restaurant if magpabayad sa appetizers. And dili lang ni 1 or 2 ha, at least 5 jud kasagaran, and some with soup na. They serve appetizers while you wait for your order so makabusog na gyud siya. Depende sa restaurant, dili lang pud all veggies. Other restaurants serve sweet dried dilis or candied peanuts and potato salad as appetizers but standard jud na ang kimchi – the one we all know as kimchi, kanang pechay. 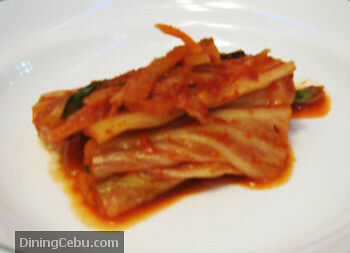 There are many kinds of kimchi man, different veggies ba. So what’s served at Dakimong? 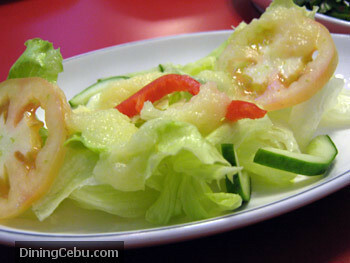 In most restaurants, naa na ni bayad nga salad. If you like this kind of salad like I do, bonus na jud ni na free siya ug refillable pa gyud. Unya di man ta dapat maulaw ana mangayo more kay normal raman na in Korean restaurants. We cooked Korean pancake before in my Korean class years ago. 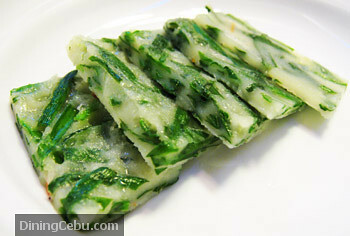 As far as I can remember, flour and egg man lang ni with spring onion, but this one kay bu-chu not spring onion. This one served at Dakimong is a bit bland for my taste, but dipping it in gochujang (red bean paste) solves the lack of taste. Contrary to popular opinion, not all kimchi is pechay and spicy. According to my Korean friend, some of their kimchis are sweet. 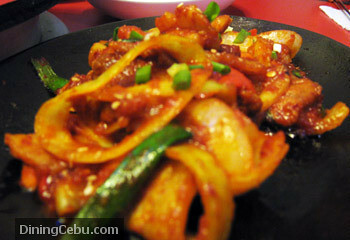 The one served at Dakimong is the usual one served at most Korean restaurants here in Cebu – plain spicy. That was the first time I saw and ate this appetizer. I had no idea what these leaves were, and I had to ask my Korean friend to identify them. My mom, who has probably gone to all the markets here in Cebu, had no idea what this vegetable is either. Bu-chu looked like grass clippings to me at first. Because it was new to me and it didn’t smell bad, so hala kaon dayun ko. Bu-chu is like flat spring onion, but it doesn’t taste like one. Actually, dahun lang gyud iyang taste. I totally love this appetizer! It’s sweet and a bit spicy. The sweet taste kay murag sweetened pineapple juice. 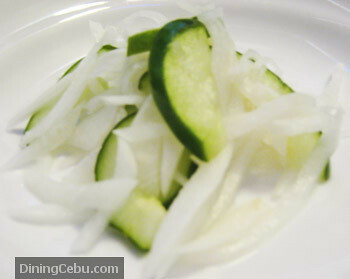 My mom loves this radish and cucumber salad served at Dakimong. Fresh and without the intense smell that radishes are known for, this salad is really good. 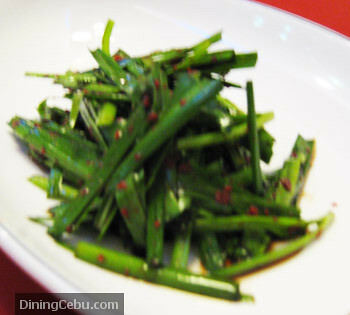 Pickled radish is served as appetizer in almost all the Cebu Korean restaurants I’ve been to. The yellow-colored radish salad at Korea House Restaurant was delicious to me, but this one at Dakimong tasted even better. I’m not a radish fan. In fact, I don’t eat radish unless served in Korean restaurants because the smell normally annoys me. The creamy glob in the middle was actually two pieces of cheese (cheddar I think) that melted. The cheese slices were visible when the dish was served. This was just noodles with cheese, nothing out of the ordinary but it was still good. I tried making one at home but di siya lami unlike this one. There were several chicken slices with the noodles. This can be a complete meal even if you’re not on a diet kay daghan siya. This can be divided among three people. Kaning mga “meal” sa Dakimong kay sort of like budget meal nila because most Korean dishes (even in other restaurants) have prices above Php 200 for full meals so this one was indeed a good bargain. Donkas is actually just breaded pork chop, and this one at Dakimong was quite a big piece. 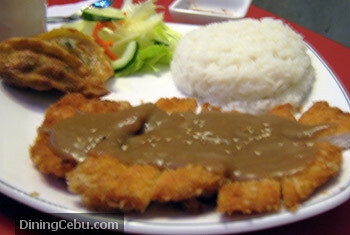 The pork was tender with okay-tasting gravy, not pud as lami sa gravy sa KFC or even sa Jollibee ha but okay ra pud. The meal also comes with rice, fresh vegetables, and 2 pieces of gunmandu (vegetable dumplings). Gunmandu is like Japanese gyoza except these served in Korean restaurants have vegetable filling lang. The pork chop tastes okay with the salad. The gunmandu was a bit salty for my taste. Osam is squid. Bulgogi is a style/type of cooking so that’s why naay pork, beef, and even chicken bulgogi. Some bulgogi look red, others plain brown lang, depende jud sa pagka-timpla but marinated na ang meat gyud basta bulgogi. This one at Dakimong was really delicious because it has a sweet sauce na makapagana jud sa rice na tag Php 40 ang per metal bowl serving. This Php 40 serving rice is actually quite cheap compared to other Korean restaurants in Cebu. Murag Japanese rice na, kanang type na pwede ma-chopsticks. As for the squid, well cooked but not tough, and sweet and spicy – my fave. The drinks at Dakimong are limited to canned soft drinks and iced tea but unlimited mineral water na. Molingkod pa gani mo, hatagan na mo ug cold water. Ingana jud ang normal sa most Korean restaurants bahalag noodles ra na imung gipalit. What I like sa Dakimong kay not strict with the drinks; they allowed us to buy in the nearby Thirsty booth, but basin buotan lang pud tung waiter hehe. Also, when you order take-out, they still send appetizers. Two thumbs up! I would recommend Dakimong to first-time Korean food trippers. If you don’t like spicy food, you can always tell the servers to tone down the spice. They have many flavors also that are not present in our food, that’s why they are worth exploring. 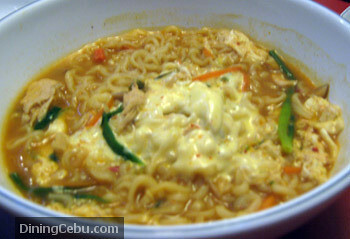 Naa gani sila noodles na bugnaw jud, as in ice cold, although that one I don’t like much. I encourage you guys to try Korean food because it is probably one of the healthiest in the planet. Korean cuisine has lots of vegetables and spices that have anti-oxidants. Studies have shown that Koreans have one of the lowest cancer rates, second only to the Japanese. Healthy yet delicious food, that’s how I would describe Korean cuisine so don’t be intimidated by the “red” color of their food, mas halang pa atung mga local sili kaysa ana nila. « Will I Go Back to Casa Verde Ayala? i love korean food…….I’ve been to a lot Korean restaurants and I like ziburo..I’ve never tried in dakimong..I will try this weekend….